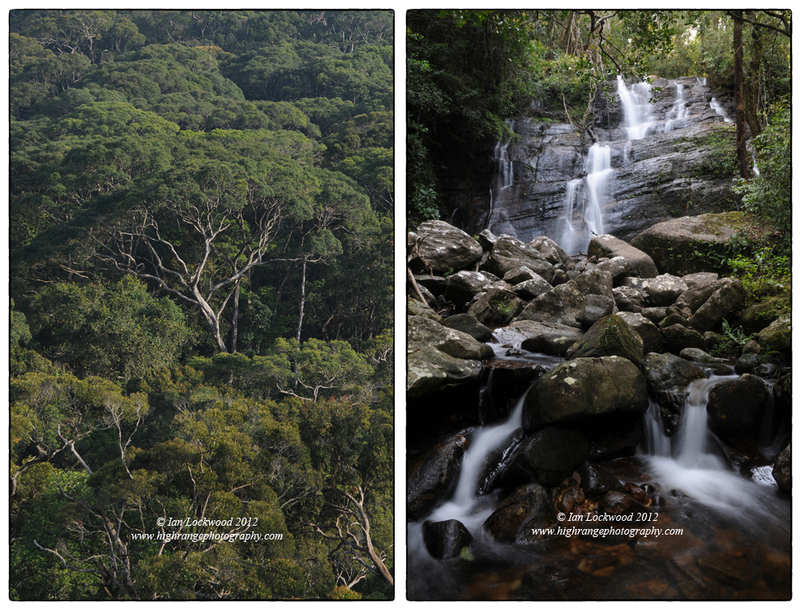 Collage of ARKive photographs highlighting Western Ghats habitats and species. These were taken mostly in the Palani Hills during the 1990s on color slide film and later sourced through the Natural History Picture Library (NHPL). This year marks 20 years since the landmark 1992 Rio Earth Summit and the signing of the Convention on Biological Diversity (CBD) that was signed by most countries. The continuing loss of biodiversity remains a pressing global concern of our times. At my regional level, Sri Lanka and the Western Ghats have been identified as “biodiversity hotpots” and it is worth reflecting on their unique biodiversity. 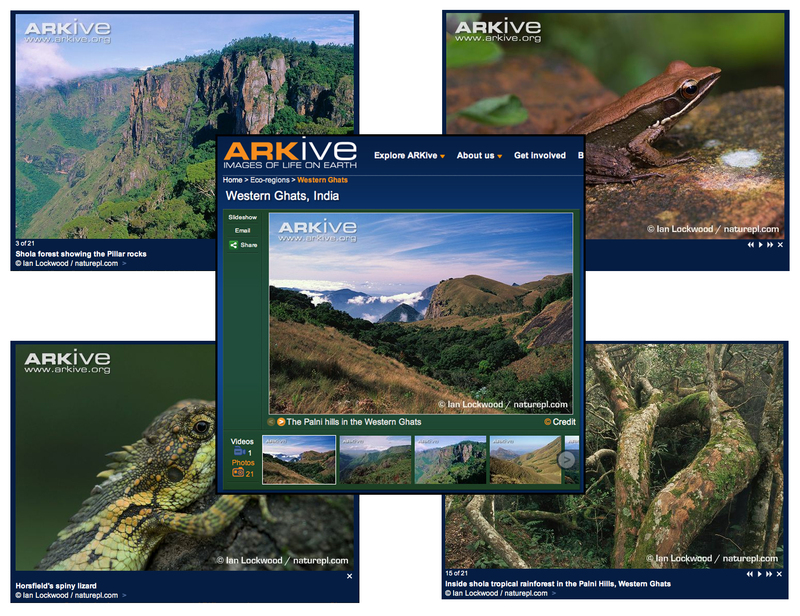 An easy way to do this is through ARKive, one of the most dynamic sites highlighting biodiversity in the world. It is a fascinating project in its ninth year with support from Wild Screen and the patronage of Sir David Attenborough. It seeks to create a digital reference and archive of all the world’s known species. Each species is highlighted with images and text on status, description, range, habitat, threats etc. I have been using ARKive’s digital archive as a reference in my teaching and writing for several years now. A few months ago I was pleasantly surprised when I stumbled across a special section focusing on the Western Ghats that features several of my color landscapes in a gallery on the habitat. Most of these were taken on forays into the Palani Hills and neighboring ranges in the 1990s. I also have some images of emblematic and lesser-known species (Nilgiri tahr, Large Scale Pit Vipers, Giant Grizzled Squirrels, Scaly Lizards, Bronzed Frogs, etc.). 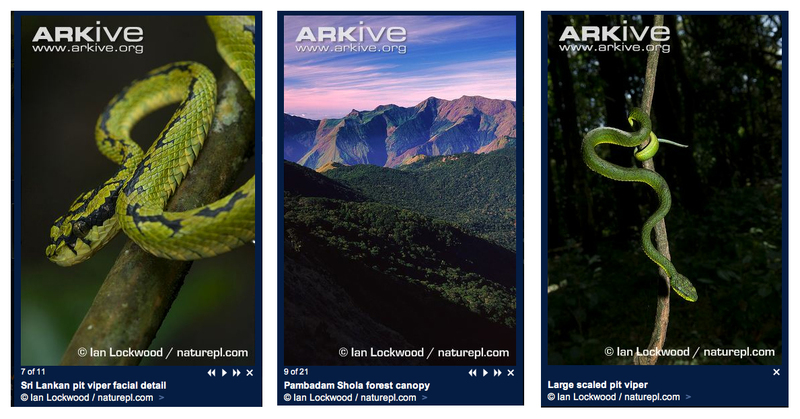 A little searching will uncover some familiar Sri Lankan species (SL Green Pit Viper).The pictures are supplied to ARKive though the Natural History Picture Library where I have been submitting pictures for some time. ARKive page on Nilgiri tahr (Nilgiritragus hylocrius). One of 30 or so images on the species. This was taken in 1993 and was aimed at my early articles (published in Environ and Sanctuary Asia) on the conservation and ecology of these endemic Western Ghats mountains goats. Two pit vipers (Sri Lankan Green and Large Scaled) and a winter view of Pambadam Shola on the border between the Palani Hills and High Range (taken in 1997). Montane forest at 1,000 meters at the Tea Estate adjacent to the Rainforest Ecolodge. 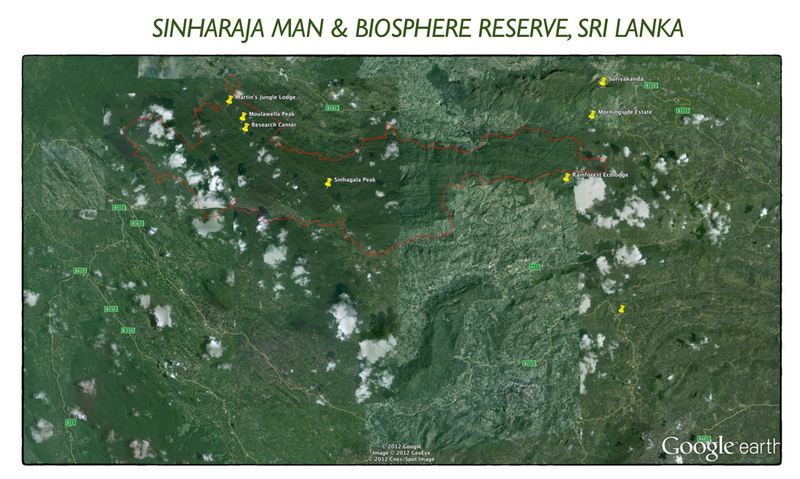 The remote higher reaches of the UNESCO-designated Sinharaja Man and Biosphere reserve are located at the union of three southern districts; Ratnapura, Galle and Mattara. It’s an area that you hear about more often than visit and, like most Colombo-based bird watchers and wildlife enthusiasts, I had focused my past visits on the western Kudawa side. Last week our family had a unique opportunity to explore and visit the eastern portions of Sinharaja above the small settlement of Viharahenaa. In the east the Ruakwana Hills that host Sinharaja rise up to 1,150+ meters and the dominant vegetation type is montane forest, rather than lowland tropical rainforest. This is one of the wettest areas in the country with annual rainfall falling in a range of 3,600-5,000 mm. However, just a few kilometers eastwards and the climate reverts to the dry zone! The natural vegetation and contours of the land are reminiscent of the wind swept forests that cloak the Peak Wilderness and Horton Plains areas in the Central Highlands. Emergent trees have exquisite, gnarled branches. There are also interesting parallels to the evergreen rainforests of Kakachi in the Ashambu Hills in the southernmost Western Ghats. Several years ago our family circumnavigated the northern border of Sinharaja, passing from Rakwana around the eastern border and Suriyakanda to Deniyaya. At that time we had glimpses of the higher forests but we were unable to explore into the area. The Forest Department maintains a bungalow at an area called Morningside and it remains an intriguing destination to get to. It has been notable for the number of new amphibian species that have been discovered by University of Peradeniya researchers (see Froglog and the The Island for details). Suiyakanda is visible from afar because of a series of transmission towers that crown it. It lies beyond the Sinharaja PA boundaries but there is still significant undisturbed forest in its vicinity. In the last year there has been a flurry of articles in the Sri Lankan press related to a controversial road that is being built connecting Suiyakanda to Kalawana (see the Sunday Leader and Sunday Times). Google Earth Pro map of Sinharaja area with Forest Department PA boundary overlaid. Significant points are tagged. 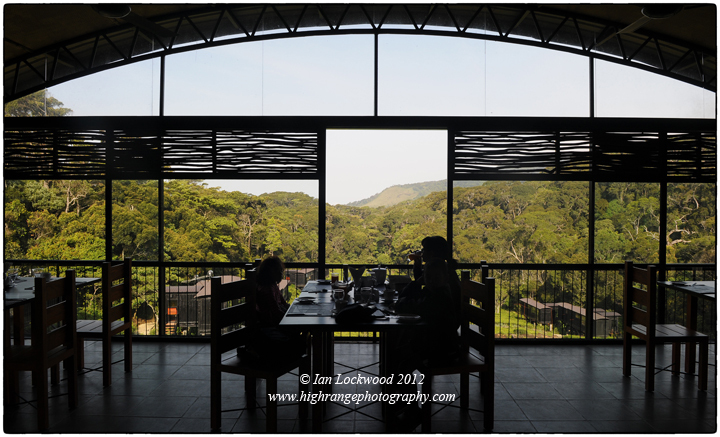 On this visit we were guests at the Rainforest Ecolodge a new establishment that is the product of careful thought and an innovative low-impact conceptual plan. Their goal is to have a minimalistic but luxurious lodge that caters to ecotourists, with a sensitive approach to assisting local communities. Many of the large Sri Lankan tourist operators (Jetwings, Atikin Spence etc.) are shareholders, in a unique collaborative effort. The project was facilitated by USAID’s competitiveness initiative. The location (E 6.389351°, N 80.596336°) and forest-dominated landscape is what moved me most. A dozen chalets and the main hotel structure are built on a slim finger of tea that is surrounded by montane forest. Guests are housed in chalets made of recycled containers with a conscious effort to minimize the use of concrete. They sit on stilts above the tea with a patio facing the forest. The hospitality and attention to detail were second to none, reminding us again about why Sri Lanka is such a leader in high-end tourism. The concern for the local community, comprised largely of Tamil estate workers, seemed genuine and much more than mere tokenism. Nearly everyone working at the Ecolodge was drawn from these communities and lower elevation settlements near Viharahenaa. Getting to and from the location was certainly a big part of the adventure but the major highlight was taking a morning exploratory walk through forest and into patanas. We were lead by the energetic guides Kumara and Sanjeeva who are building up a knowledge base of the area’s biodiversity. The two children of our hosts Indrika and Krishan also accompanied our family. The patanas, or grasslands formerly hosted tea gardens but have been abandoned several years ago and are gradually reverting to wilder states though a process of ecological succession. They adjoin the actual Sinharaja PA border, which we never actually entered. An interesting observation was the extent to which pitcher plants (Nepenthes distillatoria) are recolonizing these former tea fields. Given that the plants prefer nutrient poor soil (they derive their nutrients from insects) it makes sense, still it is better than invasive species such as Lantana camara taking over! We had an opportunity to follow one of the Gin Ganga’s tributaries up through cascades of clear mountain water, large boulders and thickets of tree ferns. Odonata species were numerous and we had fairly good sightings of bird and butterfly species too. The Sri Lankan keelback (Xenochrophis asperrimus) pictured in the post almost got stepped on by five-year-old Amy when we were passing her down a steep bit of steam. She and the snake remained very calm and it was kind enough to pose for our cameras. In the near future we are looking to bring a group of OSC students here for rainforest studies and perhaps a new community service initiative. Montane forest canopy and stream view in the Rainforest Ecolodge vicinity. Diversity from a fleeting visit to Sinharaja East. 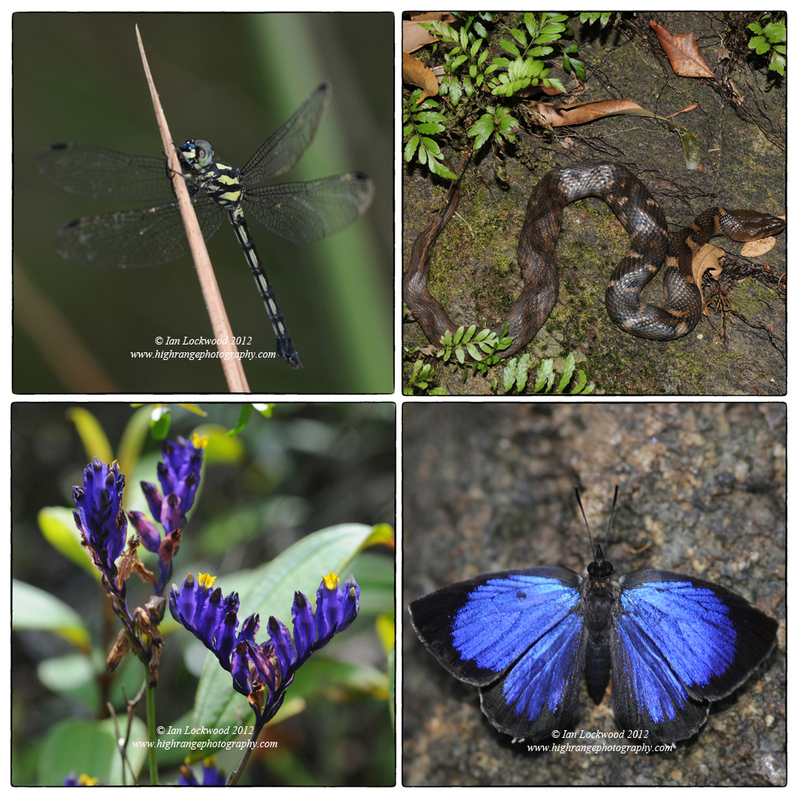 (Clockwise from upper left) female Hyleaothemis fruhstorfori which is endemic to Sinharaja, the endemic Sri Lanka Keelback Xenochrophis asperrimus, butterfly to be identified, patanas flowers to be identified. 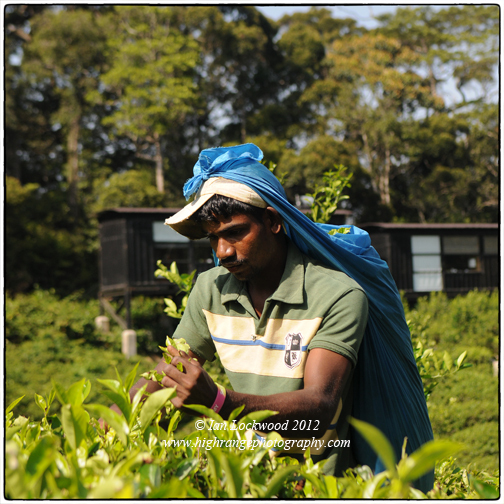 Tea picker with Ecolodge chalets in the background. Looking north over tea and montane forest towards Suriyakanda. Ecolodge restaurant view looking west. Rainforest Ecolodge chalets, tea and montane forest. Montane forest panorama at 1,000 meters at the tea estate adjacent to the Rainforest Ecolodge. Variations on the Sinharaja rainforest canopy highlighting undisturbed primary forest on the ridge with secondary growth on the lower slopes (evidenced by Calamus sp. etc.). The images were taken on a Nikon digital SLR, processed on Adobe Photoshop CS5 and then manipulated with Nik software’s ColorEfex 4 plugin. Sinharaja, the resplendent tropical lowland rainforest in south-western Sri Lanka, is a remarkable protected area, UNESCO world heritage site and living laboratory. For the last seven years it has provided an important field study site for my Geography and Environmental Systems classes at the Overseas School of Colombo. It is a large protected area (11,187 ha) and in all my years in Sri Lanka I have focused on visits to the biodiversity-rich western corner. In the last 10 days I have had the privilege of visiting both western and higher eastern portions (the next post will highlight the visits to the less-visited, higher altitude eastern areas of Sinharaja). In early May OSC’s grade 11 IBDP Geography students had four days of rich and productive fieldwork in Sinharaja’s western (Kudawa) corner. As on past trips, the focus of the trip was for the students to collect field data for their internal assessment that accounts for 20-25% of their final grade. In years past we focused on the ecosystems angle of the tropical rainforest but with the revisions in the syllabus we are now looking at tourism as a development strategy, the theme of “biodiversity and change” and issues surrounding home garden agriculture. Land use patterns and spatial analysis are important aspects for all groups and thanks to Survey Department data from 2005 we are able to map and make attempts to verify the accuracy of this data using our ArcGIS software. This year we utilized the new southern expressway and were up at our host Martin’s Jungle Lodge by noon. His lodge has ideal conditions for a forest experience sitting on the boundary between the buffer and core zone of the protected area. There is excellent secondary forest that attracts most of the endemic birds and a clear stream for guests to cool off in the afternoon. Electricity is generated by a small micro-turbine and there is limited cell phone coverage (thankfully). Weather conditions were dry, a surprise after the deluge that Colombo had experienced on April 30th. 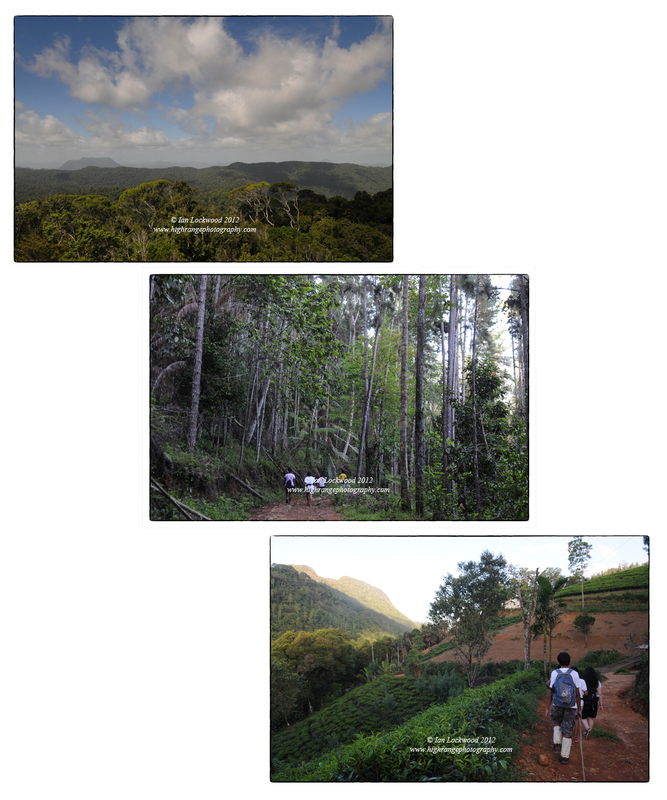 Collage showing three significant habitats that were used as study sites for students. The first is a canopy view over primary forest taken on Moulawella Peak in the core zone of Sinharaja, the second shows secondary forest mixed with a non-native pine plantation in the buffer zone. Finally the last images shows tea estates sandwiched between the small settlement of Kuduwa and the park boundary. 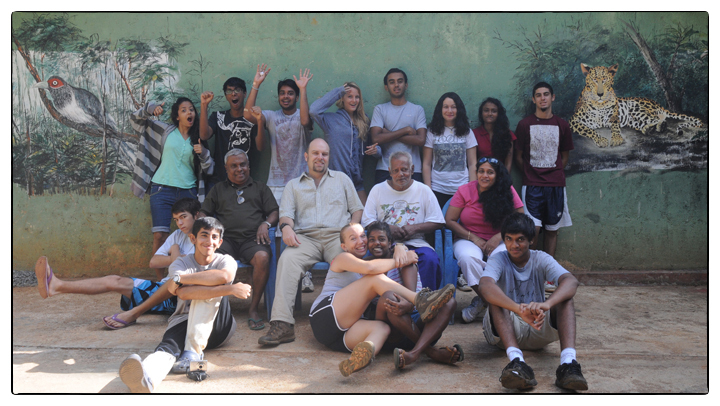 Thirteen students of varying nationalities (Sri Lanka, India, Finland, Canada, Switzerland, USA etc.) joined the trip. I was supported by Eileen Niedermann, our secondary school principal and Haris Dharmasiri, OSC’s resourceful lead science technician. Lilani Ranasigha traded places with Eileen half way through the trip. 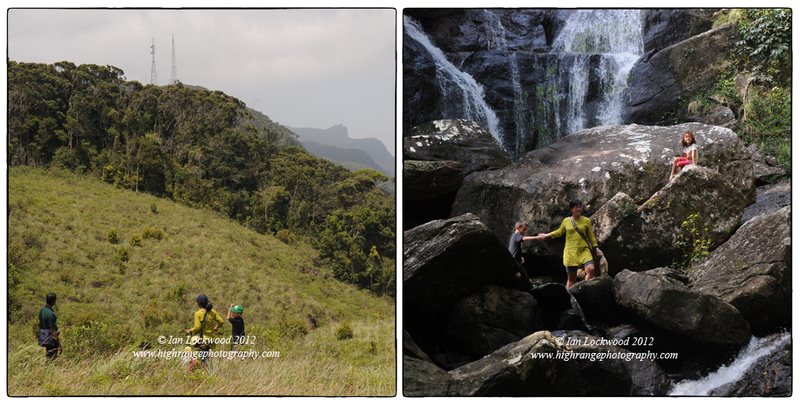 After getting settled in we started the experience with a walk and introductory lecture to the Sinharaja core area. In years past we’ve been fortunate to have Professor Sarath Kotagama to give us the context for Sinharaja’s protection and what kind of significant threat the systematic logging posed in the 1970s. That afternoon we traversed the well-worn tourist paths though secondary, primary and ridge forests as we moved towards the research station. This is a major focal point (and former logging camp/maintenance depot) for all visitors to this side of Sinharaja and we use it as a base for studies in primary and secondary forests. The Blue Magpies (Urocissa ornata) did not disappoint and swooped down to give us an intimate encounter. The students were still consumed with removing leaches, something that would soon become an insignificant inconvenience. Over the next two days students broke into small groups to gather field data on their individual questions. 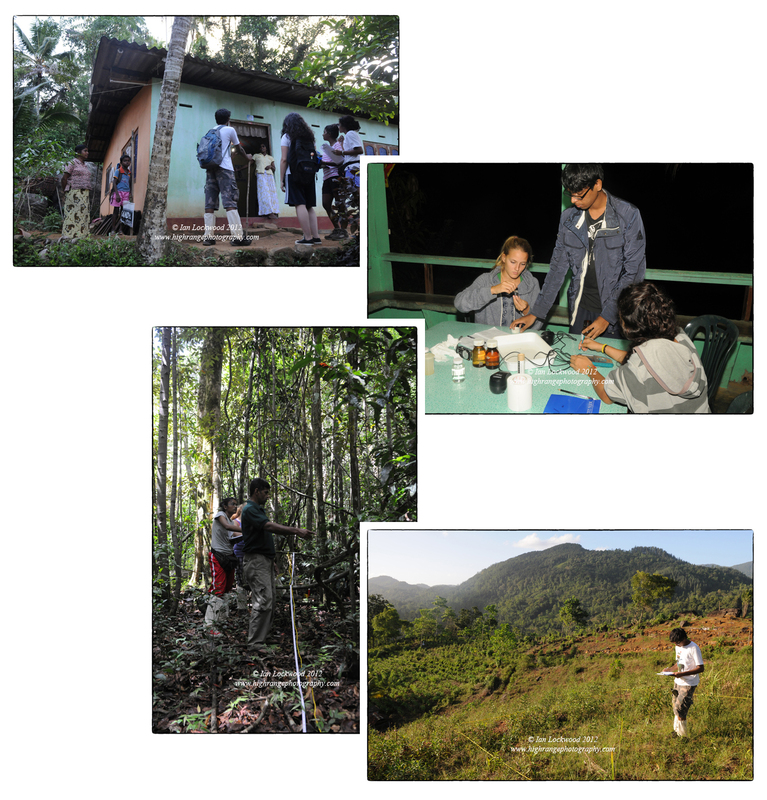 We had a group looking at plant species in different habitats, another studying soil in forest and human-impacted landscapes, a group of three studying water quality in forest streams and home garden water bodies, a group looking at tourist numbers and the idea of ecotourism and finally a group conducting an energy audit and survey of homes in the buffer zone of Sinharaja. Needless to say we chaperones could not monitor all of these simultaneously and the trip is designed for students to conduct a fair amount of independent data collection. During the course of the trip we had a chance to accompany each group, provide feedback and observe their methodology. OSC students collecting different types of data in Sinharaja for their Geography IAs. At the top students (Uvin, Brooke, Rachel & Alisha) conducting an interview with a resident about the impact of ecotourism on livelihoods. Sarah, Janik and Nadeera testing stream water samples at Martin’s Lodge. Vera and Alisha aided by Ratna identifying key plant species along a 15 meter transect in secondary forest. Lastly, Uvin using a 10 m2 quadrat to look at invasive plants in a home garden plot about to be planted with tea. Sinharaja rainforest canopy panorama highlighting undisturbed primary forest on the ridge with secondary growth on the lower slopes. Moulawella is the center peak in the background. 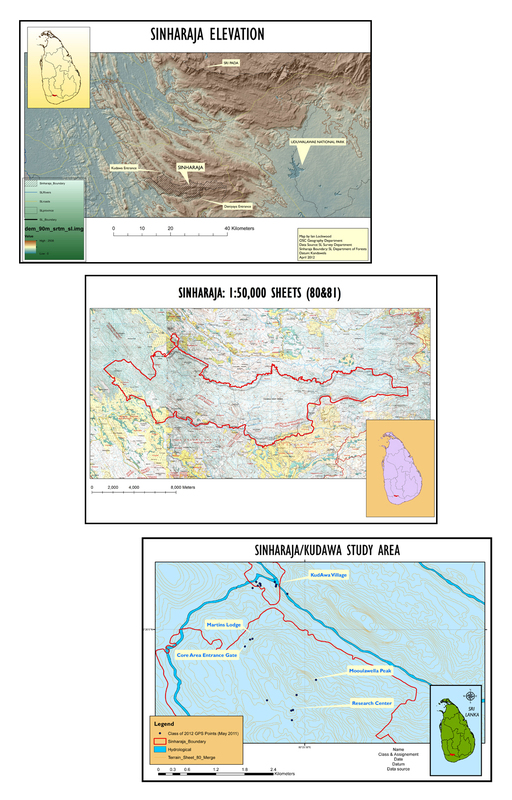 Ongoing experiments with spatial data from the Sinharaja area using Arcmap. We have fairly good data from the Survey Department and other sources and are now looking to effectively use it to give a spatial perspective to individual studies. Close inspection reveals issues with correctly georeferencing some of the data at a large scale. 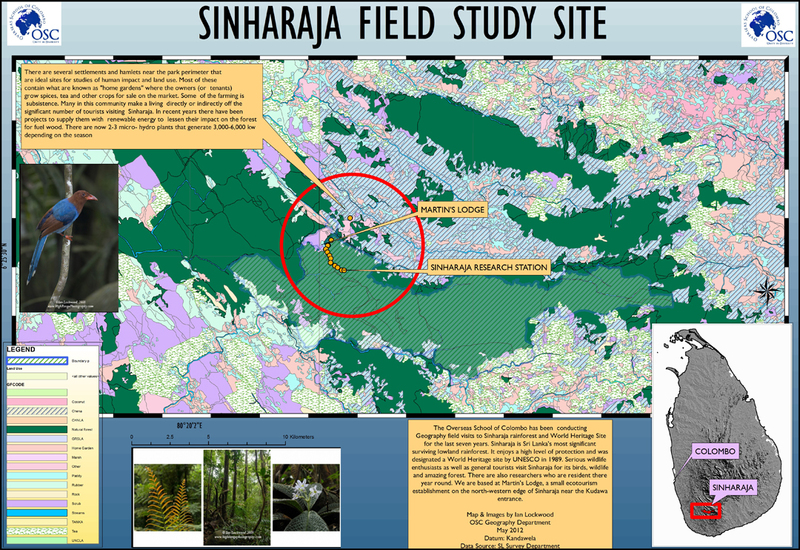 Sinharaja has hosted several landmark ecological studies including the two decade long forest dynamics study of a 25 hectare plot by the Smithsonian Tropical Research Institute and Peradeniya University and several other notable educational institutions. A classic study on the composition and spatial organization of mixed species flocks by Sarath Kotagama and Eben Goodale from 2004 serves as a model study and journal article for OSC students. Compared to these landmark studies our fleeting encounter yields limited data. The data that we gather on the trip is useful for the students’ work but at this point is not contributing to any long term monitoring of the area. What we are doing is getting a better sense of land use and home garden that should serve as an important evidence of patterns at this point in time. 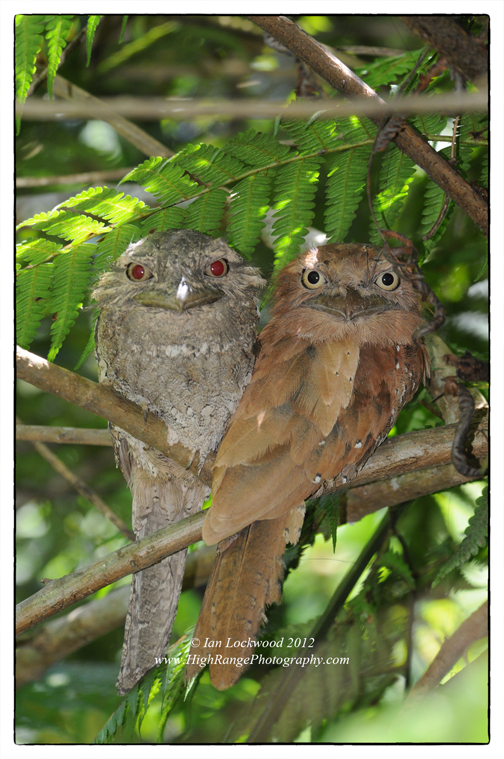 Sri Lanka/Ceylon Frogmouth (Batrachostomus moniliger). Adolescent male and adult female. Birds and the rich diversity of Sri Lankan endemics is what first drew me to Sinharaja in 1999. During a 4 day visit with my cousin Anna we trekked all over the different paths, including Moulawella and Sinhagala, looking for mixed species flocks and using just binoculars and field guides (no cameras!). On this trip to Sinharaja I had less time for birds because of the focus on human impact and land use patterns. However, we did encounter several mixed species flocks and had delightful views of a Red Faced Malkoha (Phaenicophaeus pyrrhocephalus) and Malabar Trogon (Harpactes fasciatus) as well as the other flock members. A highlight for me was getting to observe and photograph a pair of Sri Lanka Frogmouths (Batrachostomus moniliger) on the return from our hike to Moulawella. 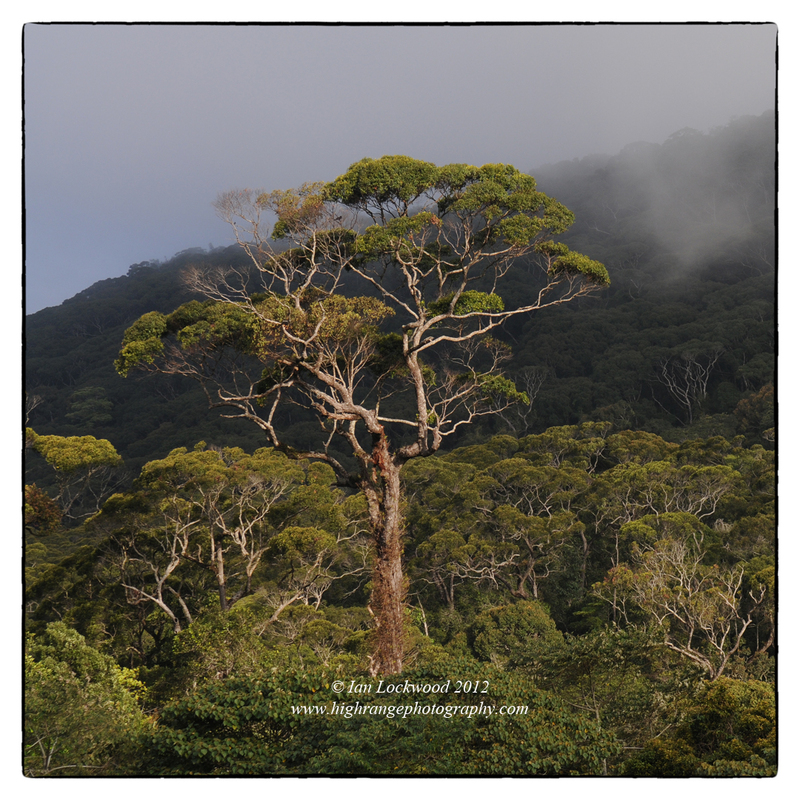 They were located by our energetic and informed guides Dinushka, Shanta and Ratna in a thicket of tree ferns. All the students got to see the endemic Sri Lanka Green Pit Viper (Trimeresurus trigonocephalus) and a shy Hump Nosed lizard (Lyriocephalus scuatus) up close. We returned to Colombo n May 3rd with plenty of field data and experiences not to be forgotten. I was delighted with the outcomes of the trip and the knowledge that I was turning around with my family to visit the other end of Sinharaja on the next day! 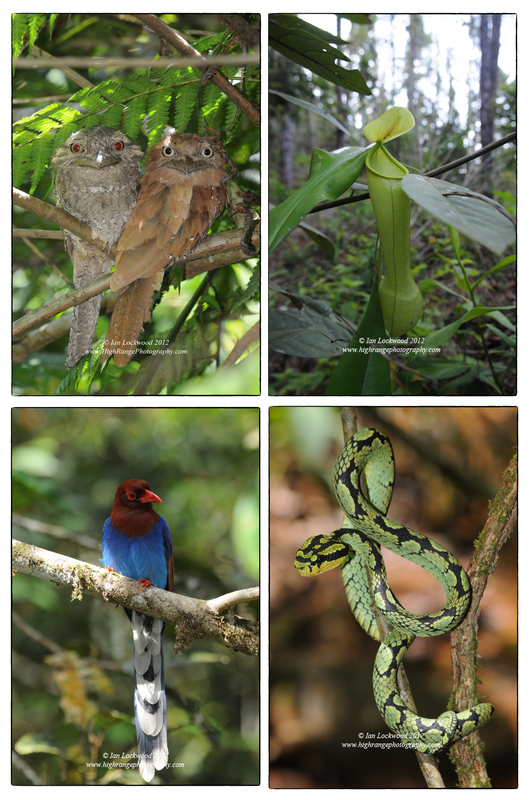 Emblematic species from Sinharaja seen on the trip (clockwise from upper left): Ceylon or SL frogmouth (Batrachostomus moniliger) adolescent male and adult female, Pitcher plant (Nepenthes distillatoria) in a former pinus plantation, SL Green Pit Viper (Trimeresurus trigonocephalus) and the SL Blue Magpie (Urocissa ornata). Rainforest emergent layer and canopy, looking southwards from Moulawella Peak after a climb up with most of the group on Thursday morning. OSC’s Class of 2013 Geography students at a playful final group picture after four days of productive research and fieldwork. Our host Martin is seated second from the right. Haris Dharmasiri, OSC’s lab technician par-excellence is seated on the far left while Lilani Ranasingha, our energetic female chaperone is seated on the far right.